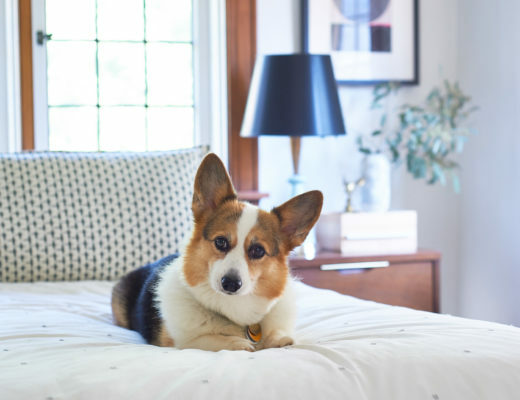 This post contains affiliate links, if you make a purchase after clicking one of my links, I will receive a small portion of the sale at no additional cost to you. 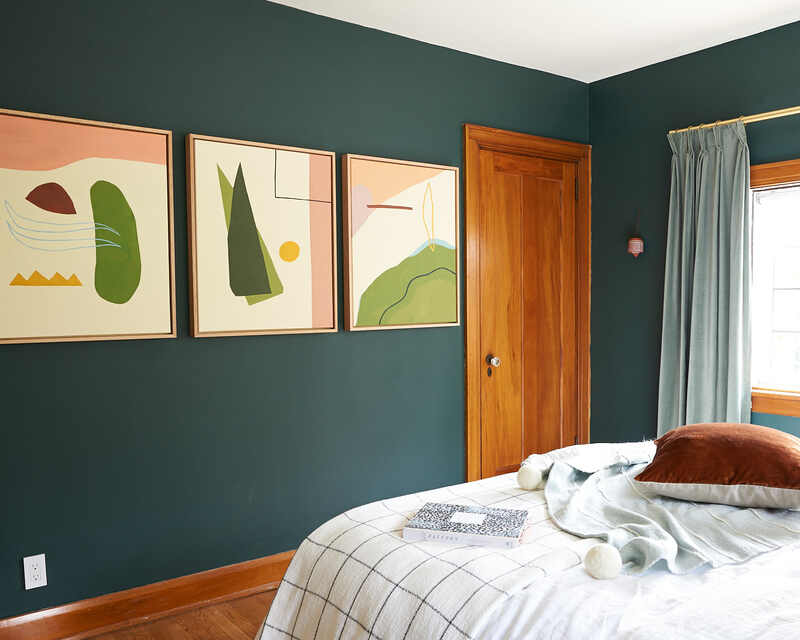 For my One Room Challenge Guest Room Project Reveal (check out all of my One Room Challenge Posts here), I showed off my 3 DIY paintings mounted in handmade oak frames. 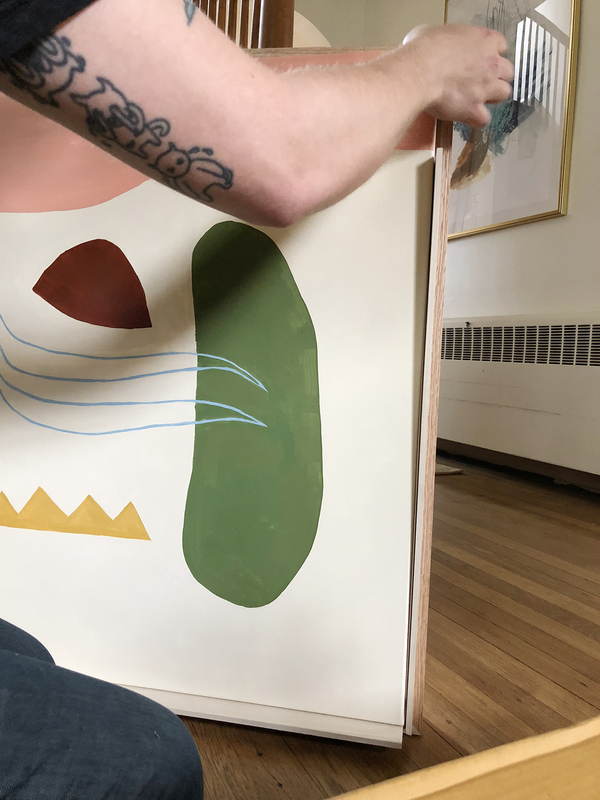 I completed my paintings to solve the challenge of filling one large bank wall and wanted my DIY abstract art to really shine so worked with my dad to build custom canvas float frames. 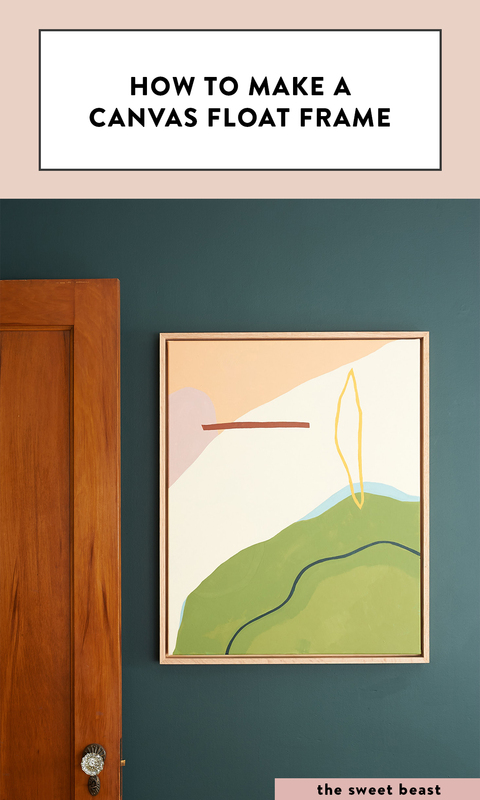 Float frames are different from regular frames meant for canvas because they are made to be just a little bit bigger than the canvas itself. 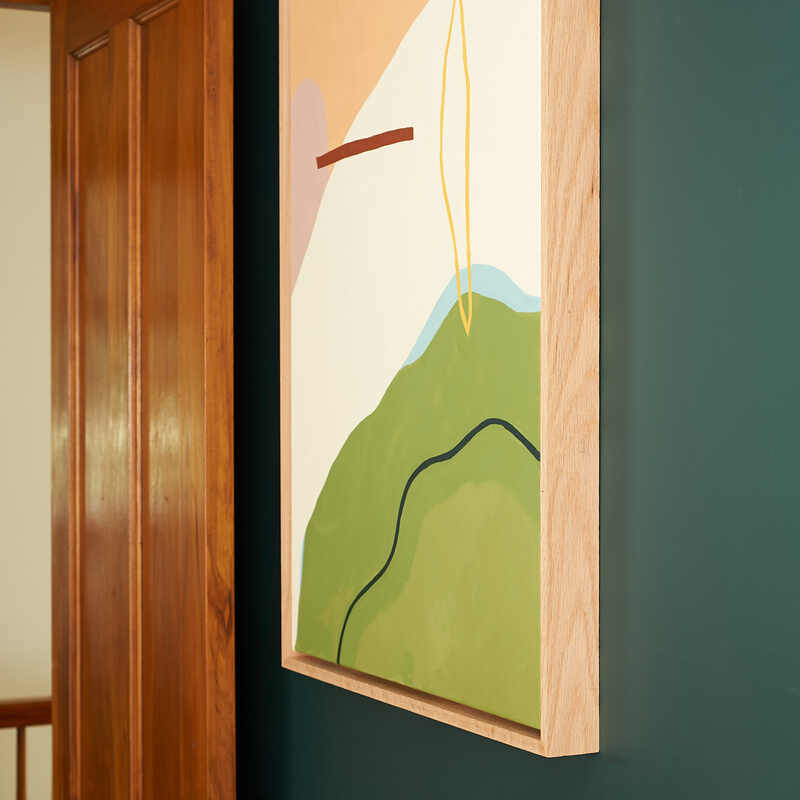 While a regular canvas frame would hug tight against the canvas, a float frame has an intentional gap all the way around to make the canvas look like it’s floating inside the frame. 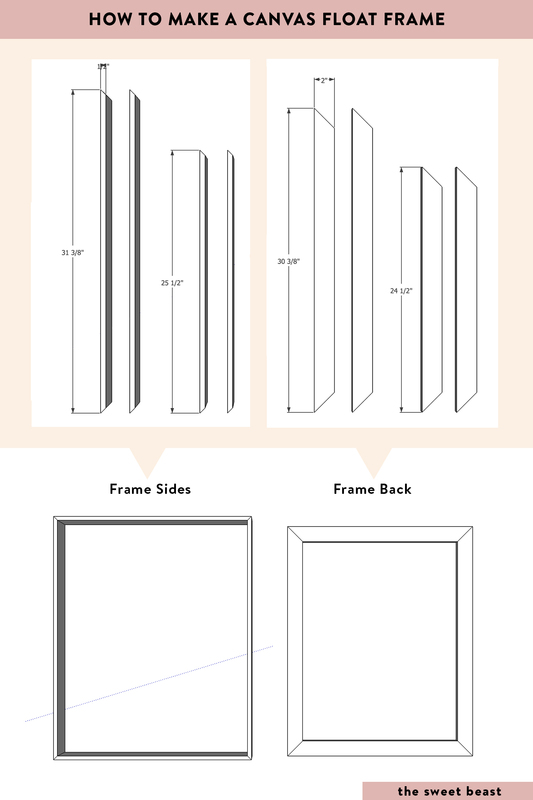 Before I get into the how-to of it all, lemme show you what one of these frames looks like IRL. 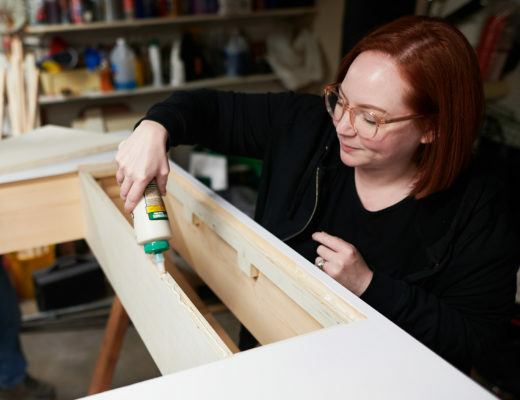 I’m going to walk you step by step through the process of making your own float frame for canvas art. Heads up – there are power tools involved. 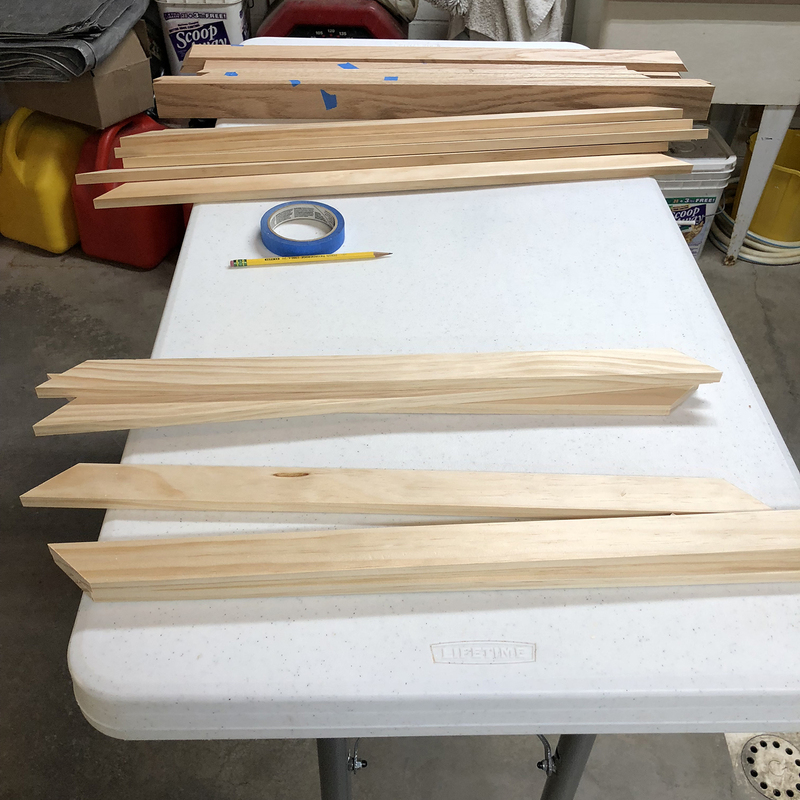 We don’t have a table saw or miter saw of our own yet, so I visited my dad who lives a couple hours away to help me hustle on this project for the Spring 2018 One Room Challenge. 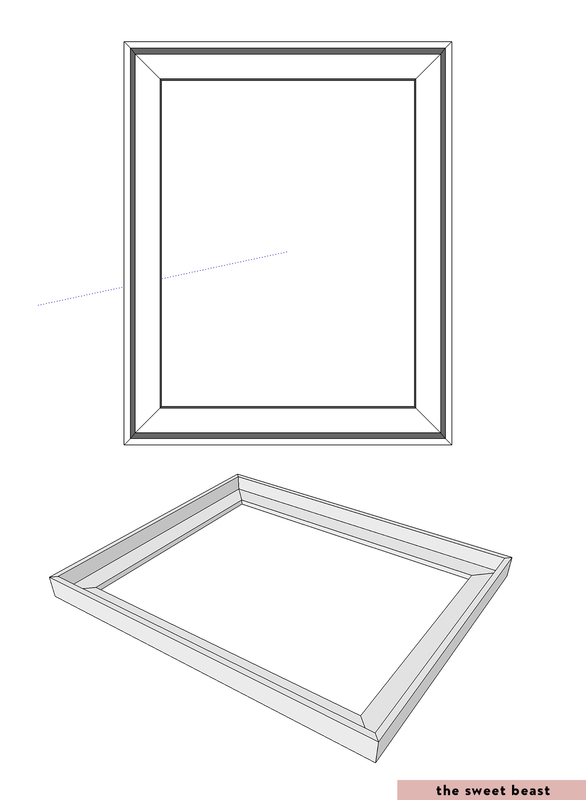 My first step, as with most projects, was to draw up a plan in SketchUp. 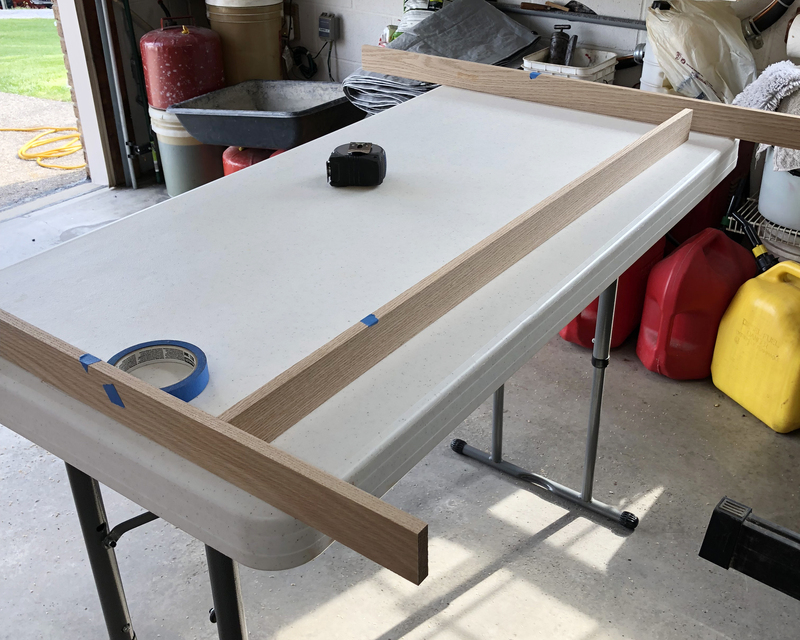 I wanted to figure out the best way to assemble the frames so that the edges were a clean, solid plank and that the back was tidy. It also helps me to draw things out to check on proportions so I could be sure the wood frame wouldn’t look too thick against the canvas. 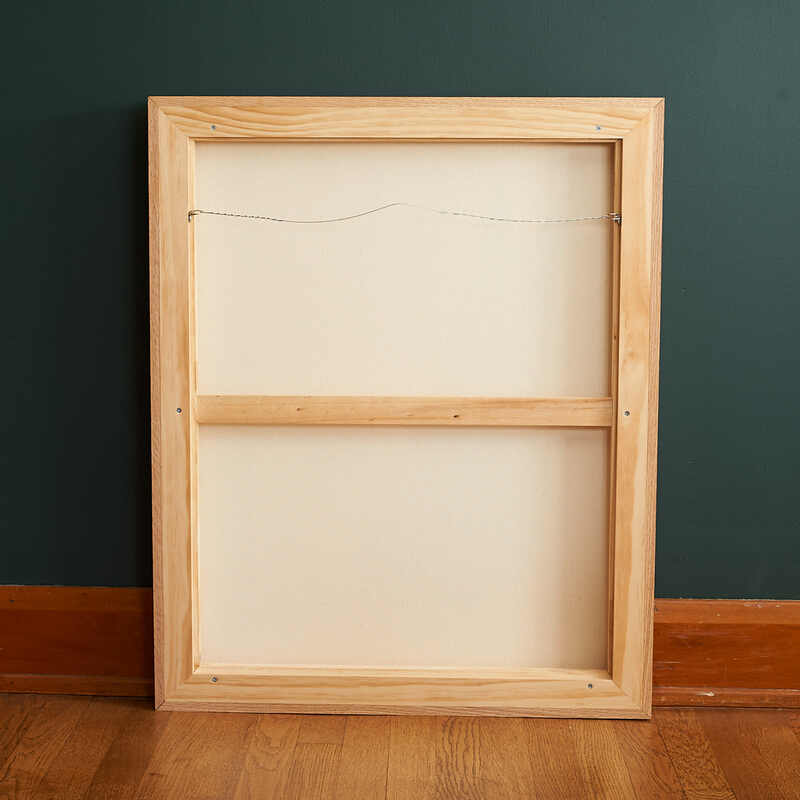 My frames are made to fit 24×30″ canvases – I picked mine up at Jo Ann’s. I decided I wanted a 1/4″ gap between the canvas and the frame and for the canvas to be recessed 1/8″ from the front edge of the frame. 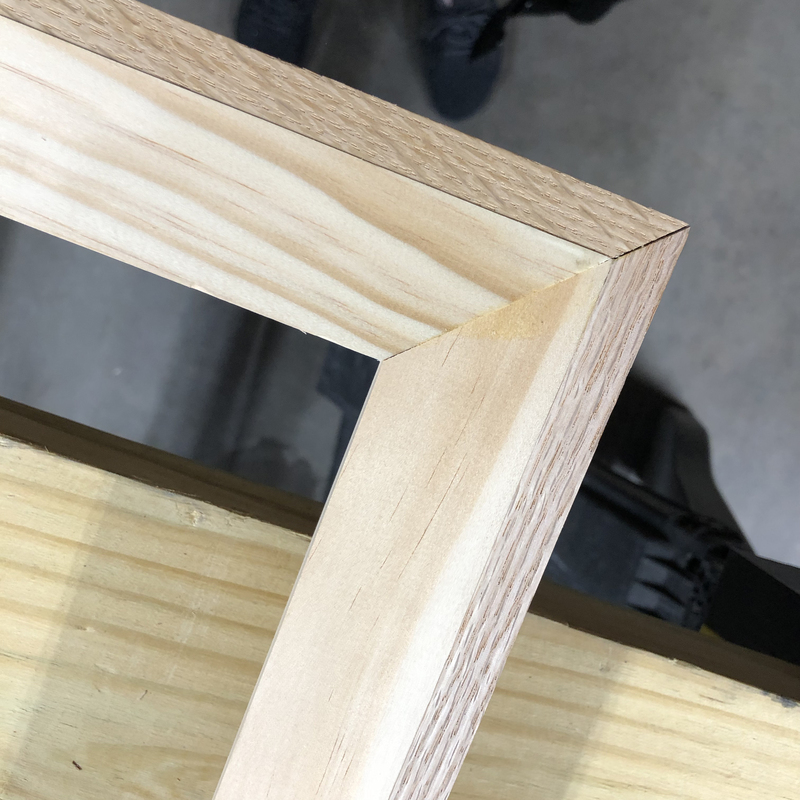 Up until my dad and I made it to Home Depot, I wasn’t sure if I’d be going with oak or pine for the frame. 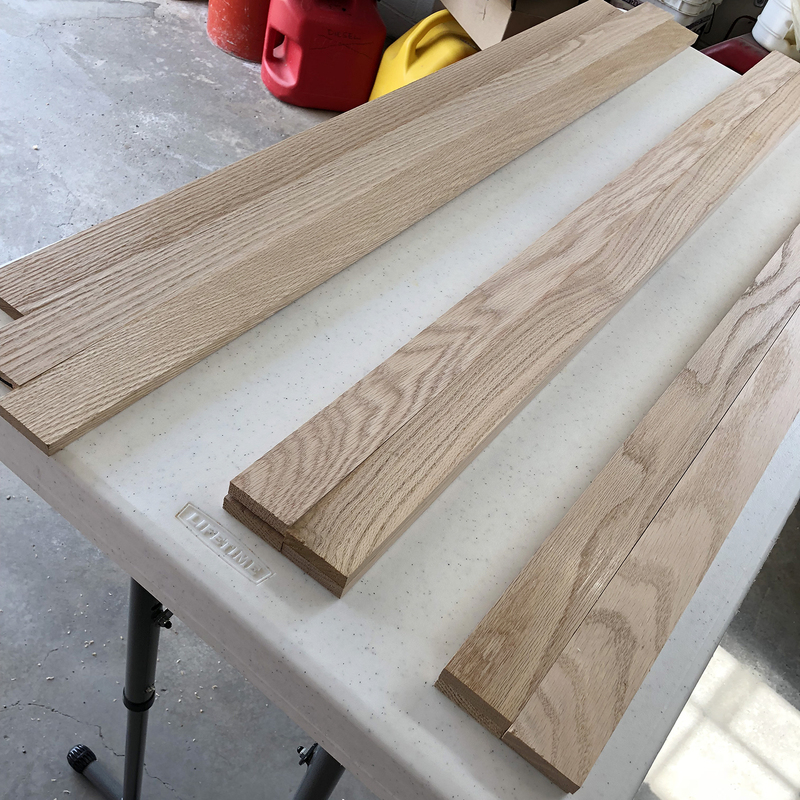 Poplar is a good, inexpensive option but has a lot of green in it so it’s a good choice if you’re planning on painting it. 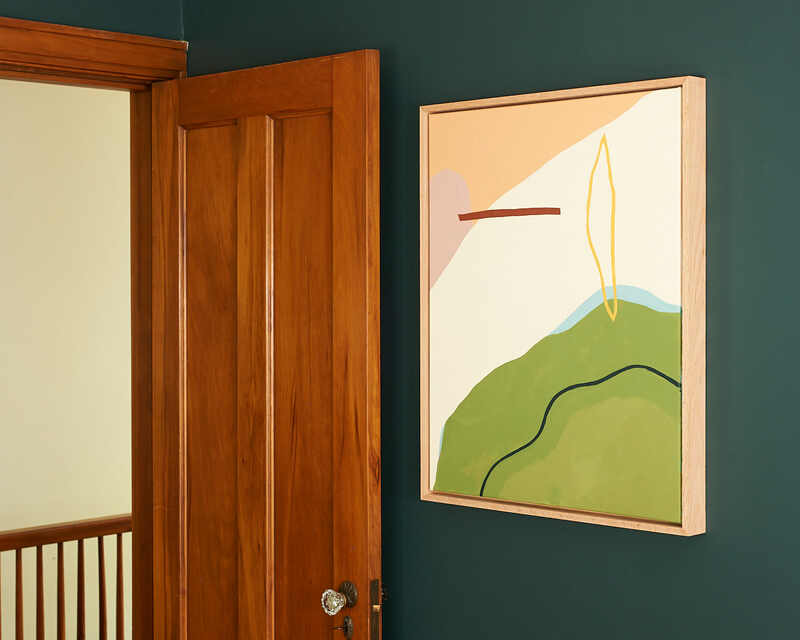 I knew I didn’t want to paint my frames and I didn’t really want to stain them either – once I set eyes on the oak, I knew it was the way to go. When you pick your wood, try to find the truest wood planks you can. You want wood that won’t lie to you (does this count as a pun?) but more than that, you want the straightest wood you can buy. How do you tell if a plank is straight? Hold the plank up with one end close to your face and look straight down the wood – you’ll be able to spot curves in the wood pretty easily. See above for the proper form as demonstrated by my dad. My dad and I looked at every board in the little cubby hole and sorted them into “these are good,” “these might work,” and “these are bad” stacks. 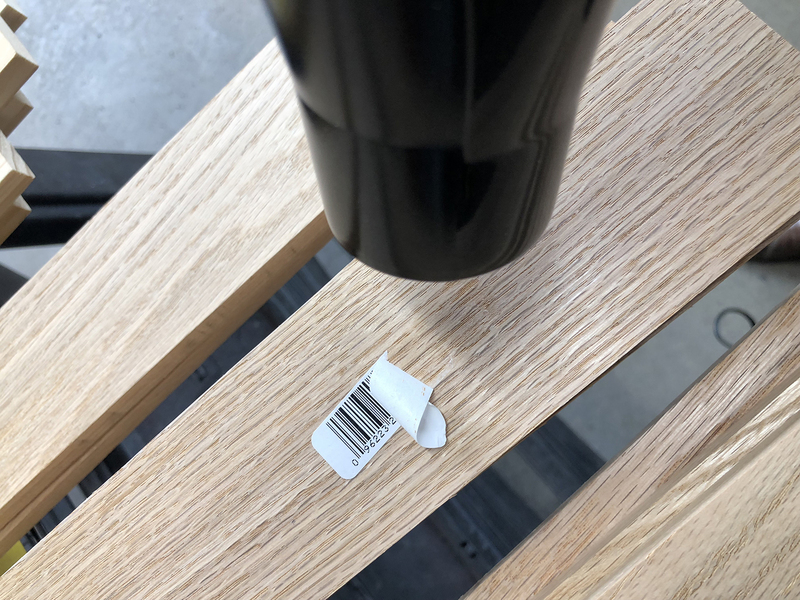 Once we got back to my parents’ house with all our supplies, I started removing the barcode stickers from the wood. They left behind a lot of sticky residue and I tried a few different methods to remove it. A hairdryer helped to loosen the main sticker from the wood but wasn’t super helpful for what was left behind. I tried pulling the sticker residue off with duct tape, but that wasn’t super effective either. 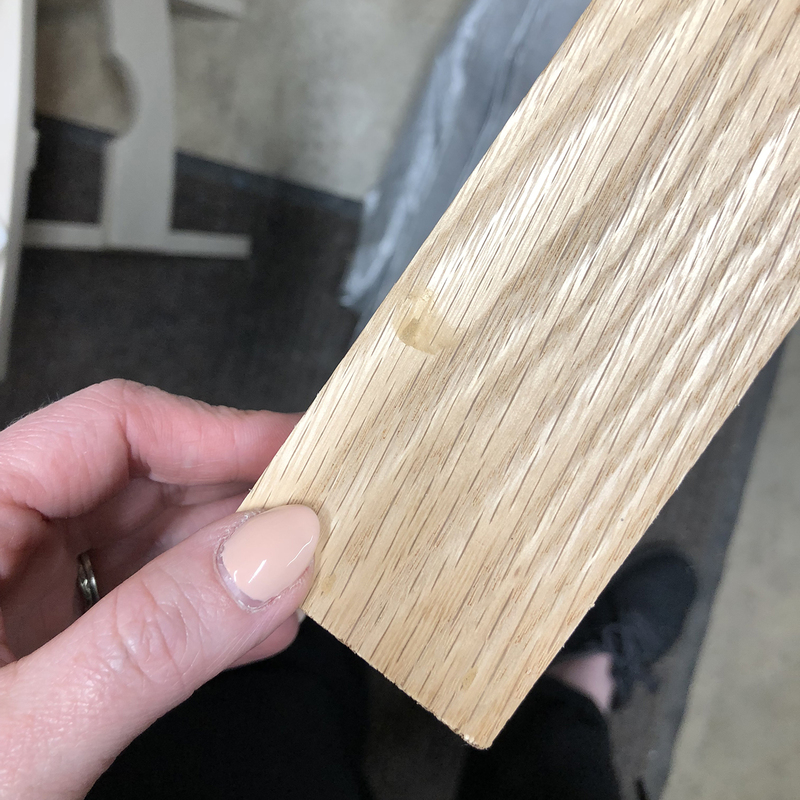 Then I tried rubbing alcohol on a rag and it worked wonders without staining or discoloring the wood – if you try this, you should probably test the alcohol on a scrap piece of work first to double check that it won’t discolor your wood. In most cases, I could still sort of see where the sticker had been but was mostly concerned with removing the sticky bits. 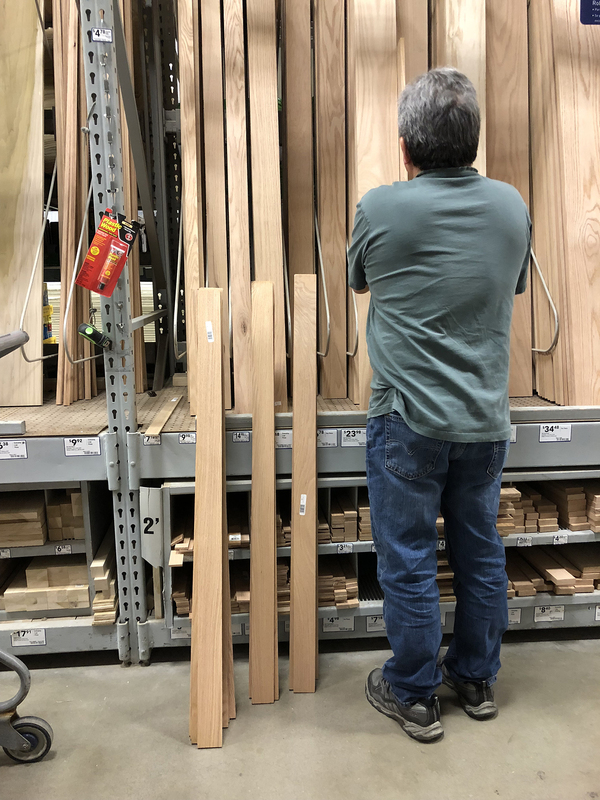 My plans called for wood at a different width than what we found at the store so my dad trimmed both the length and width of the planks on his table saw. 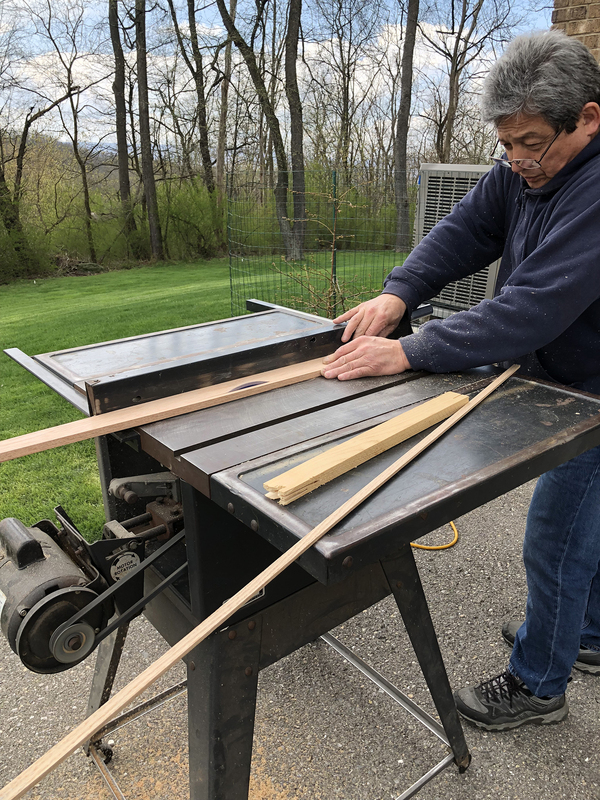 Another piece of advice from my dad, Joe: trim wood at both ends to shorten it instead of just taking from one end. 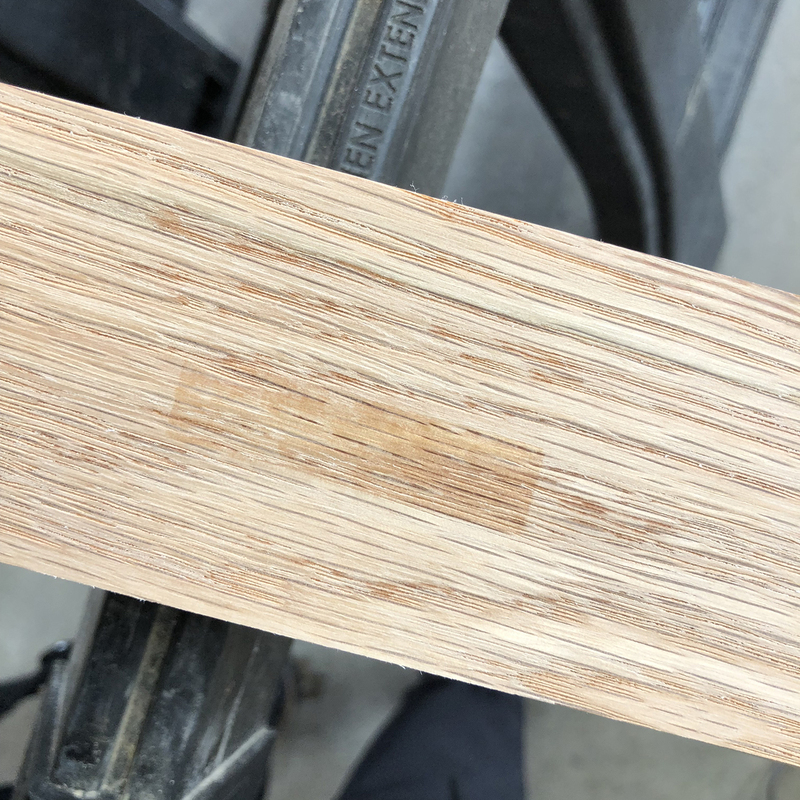 Wood sold in planks like this is often thinner at the ends because of how it’s planed. I noticed that the grain of the oak differed from plank to plank but I wanted all pieces on each frame to work together. I organized the wood by grain type (tighter, looser) and then gathered them in groups of 4 for each of the 3 frames. I also used small pieces of painters tape to mark the best sides of each piece of the wood to be used as the outside and front edges of the frame. Then it was time for those miter cuts. The pieces for the sides received cuts along their thing edge while the back pieces were cut along their wide edge. Miter cuts make for a really beautiful, profesh looking corner. Starting first with the oak pieces for the sides of the frame, we put glue on the ends and clamped them together using the corner clamps. We used a nail gun to secure the corners. The nails went in at the top and bottom of the frame rather than the sides so they’d be less visible. 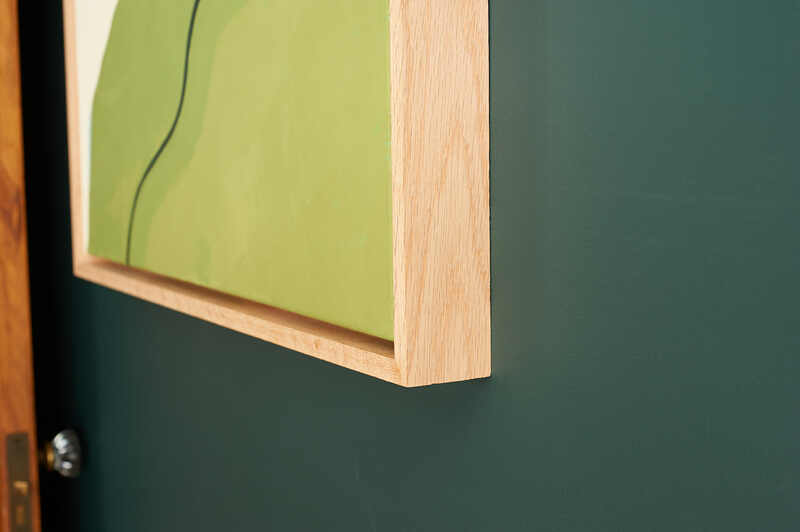 You can also use v nails and a joiner to join your corners at the back of the frame. We added more nails than is necessary if you allow for proper dry time on your wood glue. I needed to get my frames finished in one day before loading them into my car and driving home. If you can allow for at least 24 hours of dry time, you won’t have to rely on nails as much. Once the outside frame was complete, we removed it from the clamps and started fitting in the back pieces. As you can see in this picture, we needed to cut a little bit more off to get a perfect fit. 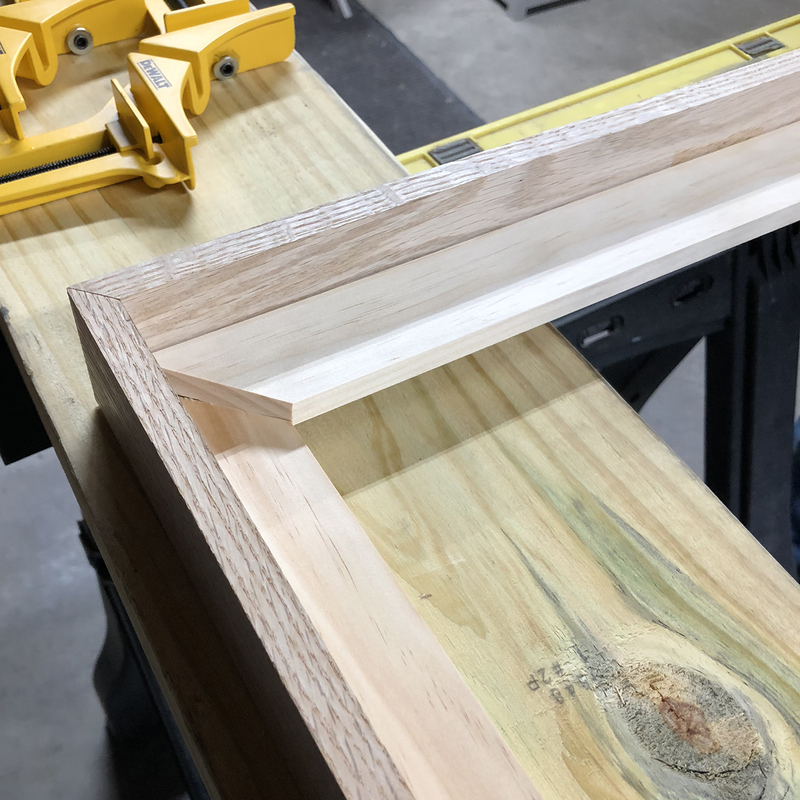 Make sure to work on a flat surface so you can push the back pieces the whole way down into the frame to create a level back for your frame. 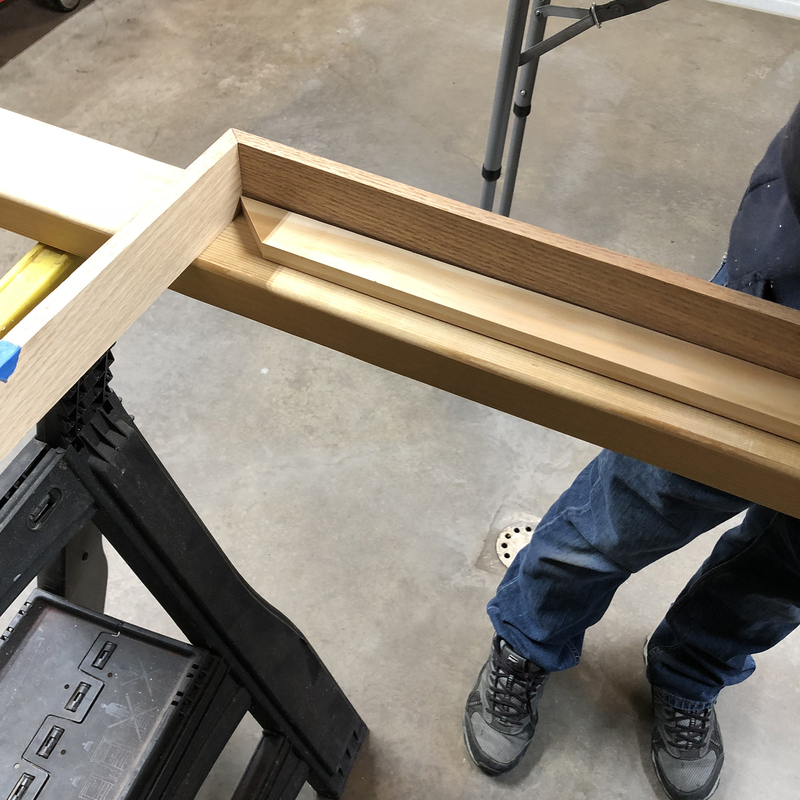 Once the pieces were fine-tuned to fit together tightly, we ran a bead of wood glue along the miter cut and the long edge that fits inside the frame. Here’s a look at the freshly glued back of the frame. 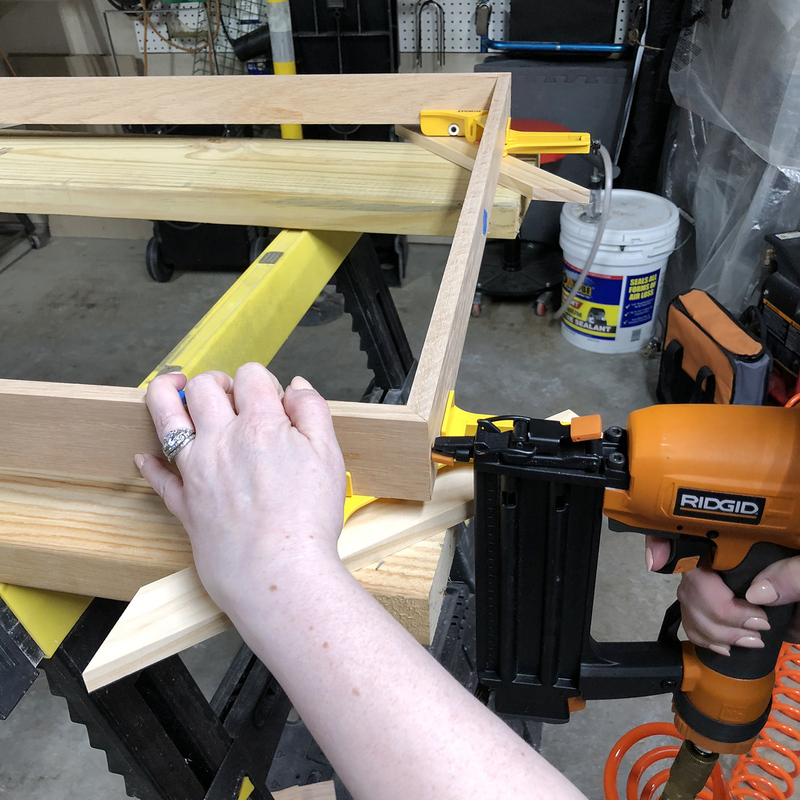 If you use a nail gun, you’ll want to fill those nail holes. 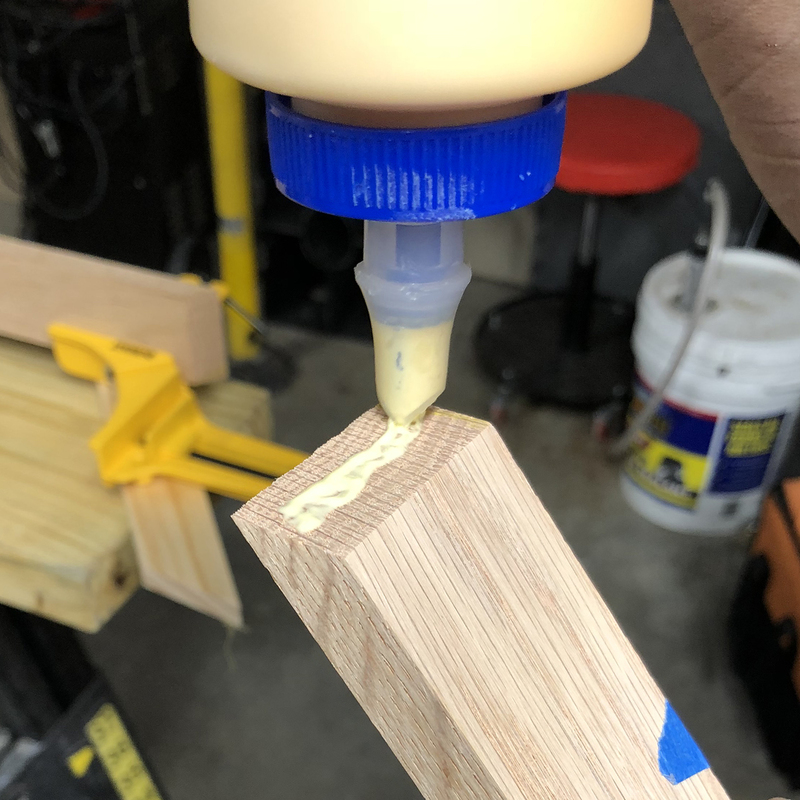 I picked up golden oak wood filler that matched my frame perfectly. For small holes, you can just squeeze wood filler out into the hole or onto your finger and smooth it out. Let it dry, see if it shrinks (it probably will) then refill if needed and let dry fully. Once the wood filler is dry, use a fine grit sandpaper to sand down high spots. 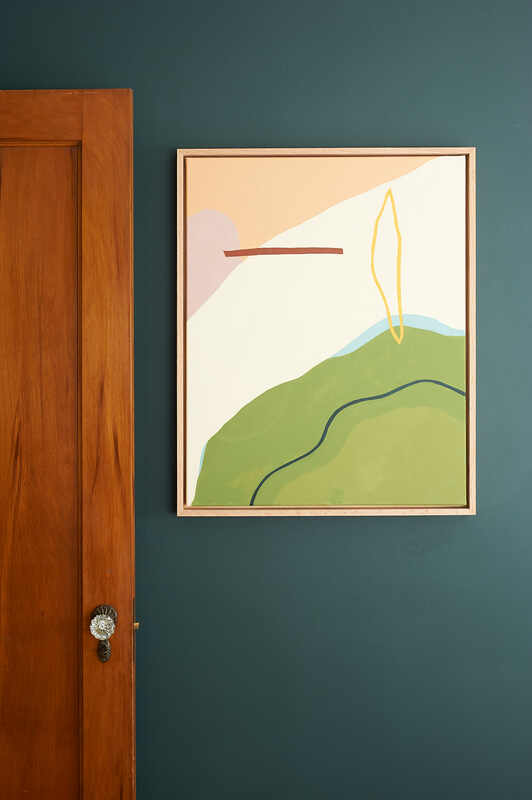 If you want to stain your frame, now’s the time to do it. If you like the natural look of the wood you use, you should seal the wood with a water-based varnish. You can use the brush-on type or spray, sanding with fine grit sandpaper between coats. Adding a non-yellowing, acrylic coating will protect your frame from moisture and make it easier to clean. 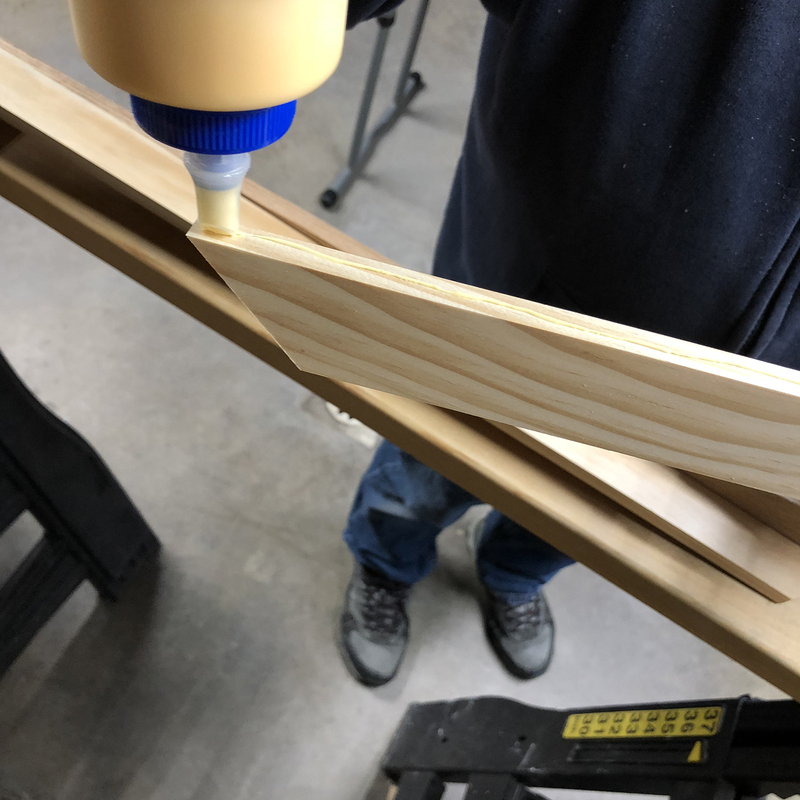 Andy picked up 1/4″ thick pieces of wood to use as shims to make sure the canvas was 1/4″ away from the edge all the way around. 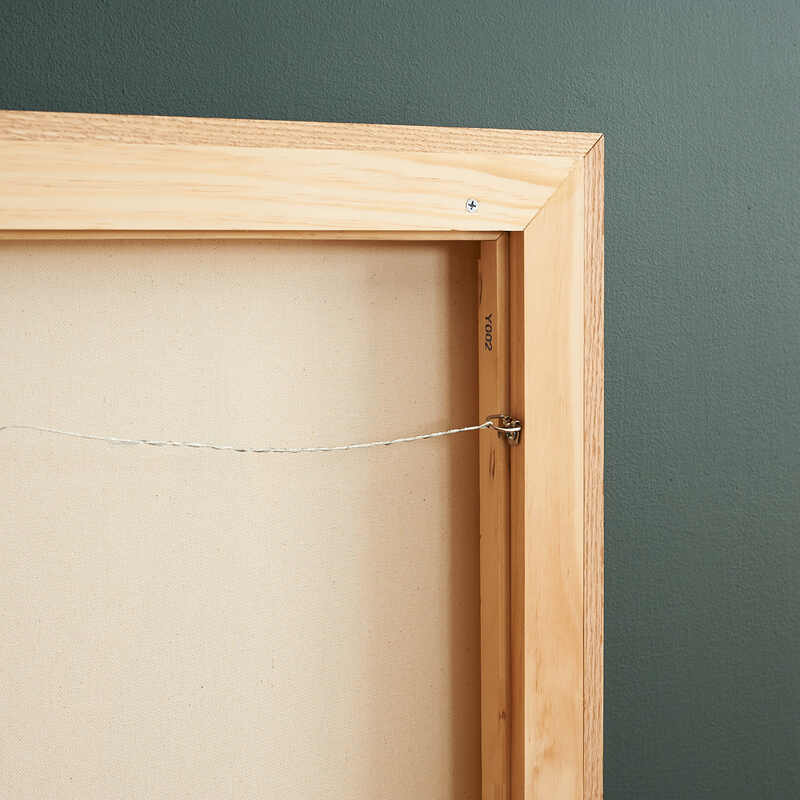 Use flat head screws to secure the canvas to the frame so that you don’t have a screw head sticking out and scratching your wall. 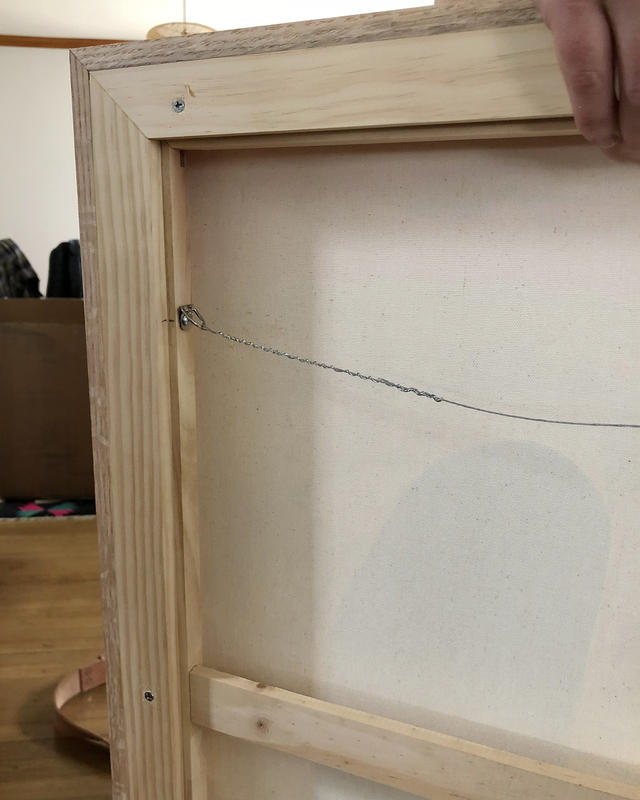 We ended up using 6 screws to secure the canvas to the frame because while the frames were squared up and flat, the canvases weren’t. Securing the canvas at multiple points to the frame straightened out the canvas. We hung the picture wire on the inside edge of the frame backing pieces. 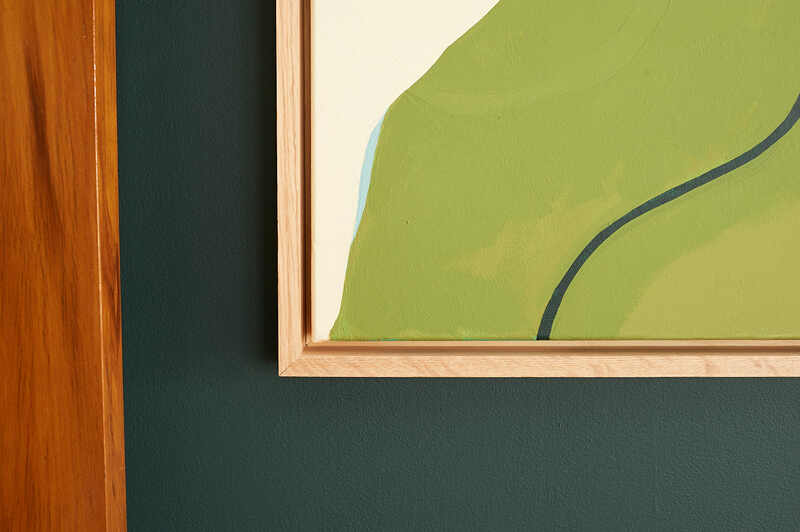 This way, nothing is sticking out on the back of the frame to scratch the walls or add a weird gap between the frame and wall. Wowowow. My paintings look so good in their new frames. 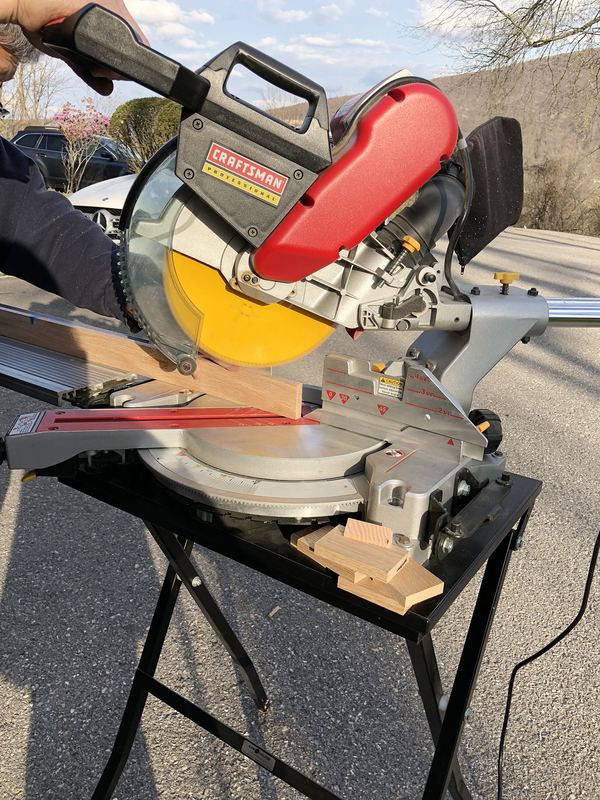 This can be a great weekend project if you have access to a table saw, miter saw, and nail gun. 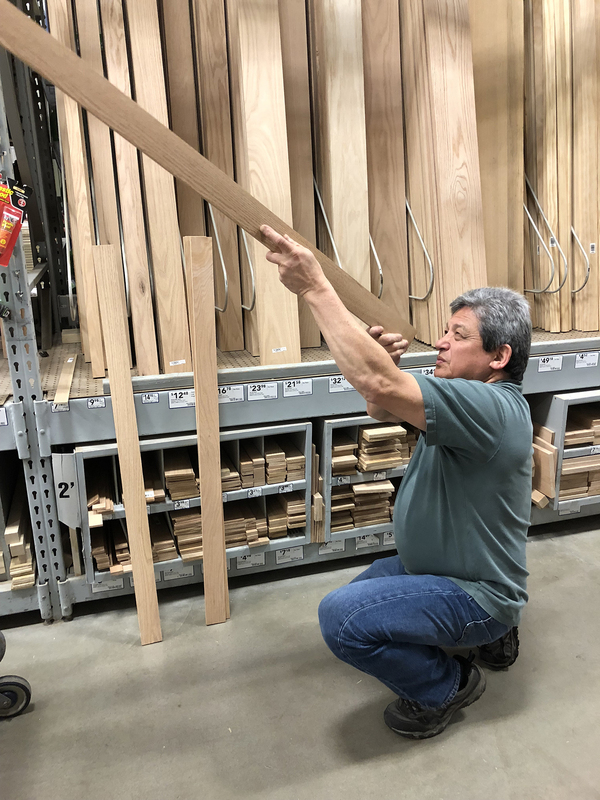 There are no special order materials here – I picked everything up at Home Depot. I love the effect the float mount gives and I’m so proud that I could design and build these with my dad. I’ll take any excuse to spend a whole day with him. Is this a project you think you could tackle? This is so awesome! I love the look and how relatively simple it is! Good job! Hi and thanks! We attached the back of the frame to the sides with wood glue and a nail gun. Fantastic! I am a former professional picture framer, and think the frames look beautiful & professional. I wish you could have included the total cost spent on supplies! Definitely helped me in deciding to make my own frames. Your paintings looks great. So thats your dad. How nice of him yo help you. 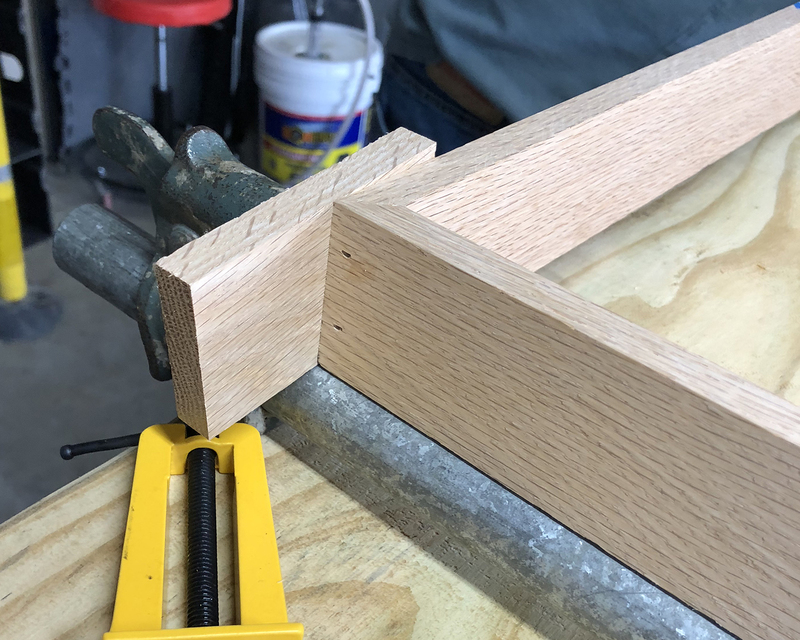 I wonder why you didn’t glue the frame sides to the backs first (to create an L profile) and then do a single miter cut of the joined pieces? Thanks! That’s totally another way to do it for sure! I’ve seen other tutorials that do it that way and it looks like it works well. 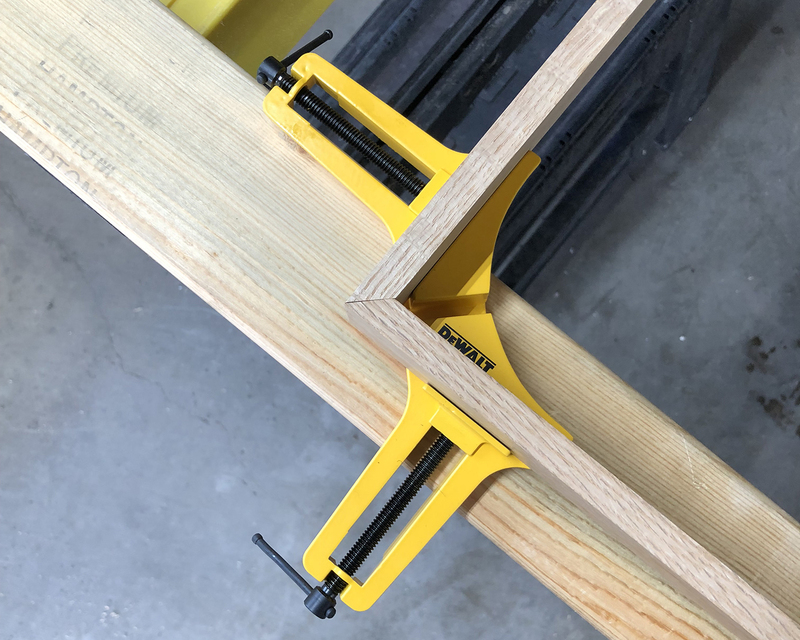 What angle did you use with the saw? I have an 11×14 canvas print and I’d like to build a floating frame could send me the formula you used to calculate your cut lengths. Very good post! Thank you! My formula for each side would be: the length of your canvas + 2x the desired gap between the canvas and the inside of the frame + 2x the depth of your wood. Hope that makes sense! Thanks so much for this tutorial. It’s clear and easy to follow. I can’t wait to get started on building some frames for my daughter’s artwork. I’ve been looking for a tutorial like this for a while. Thanks again! Your work is gorgeous! And the photos in your tutorial make it easy to follow. Do you think I could use a staple gun instead of a nail gun? The staples are pretty long. Looks awesome! What kind of nails did you use? Are those brads? I’m looking into buying a nail gun but I, not sure what to get. Can you share the deatails on the one you used? Thanks!